The Cantilever House is a pre-fabricated residence designed and built by students, and is located in the downtown Pettaway Park Neighborhood in Little Rock, AR. The Cantilever House is a pre-fabricated, affordable residence designed and built in Fayetteville, AR, by students, and then installed in the downtown Pettaway Park Neighborhood in Little Rock, AR. 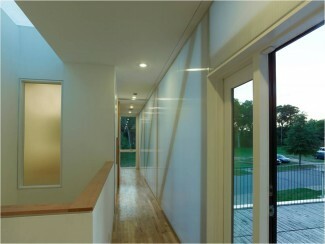 The house is composed of two modules. Module 1 (lower module) is 16' x 32' and contains the public spaces of the house: kitchen, living, dinning, and a half bathroom. Module 2 (top module) is 16' x 45' and is stacked perpendicular to Module 1, cantilevering over the front and back porches. 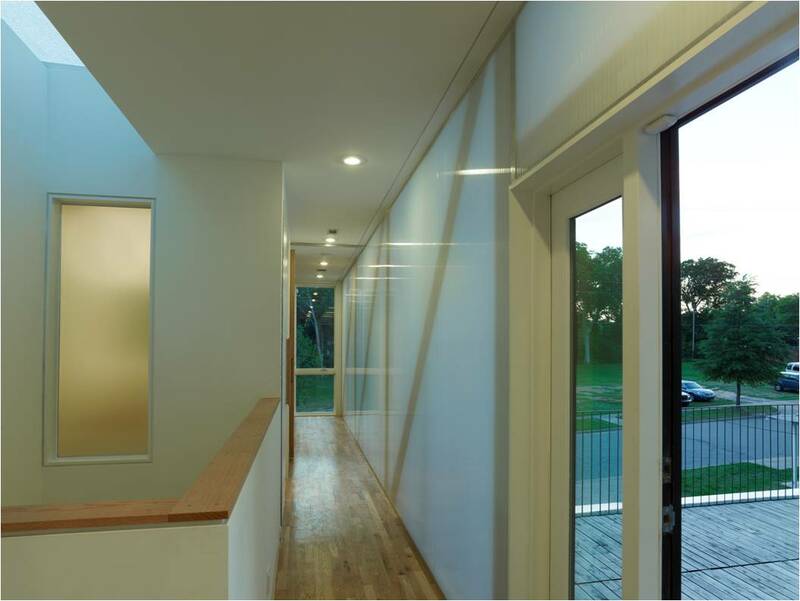 This module is the private spaces of the house: 2 bedrooms and one large bathroom. Stacking the two modules created the opportunity for a light well that connects the public to the private and is capped by a skylight. By rotating the modules perpendicular to each other, three exterior spaces are created—two porches covered by the cantilevers and a roof deck above the kitchen on top of the lower module. This extends the overall living square footage to the exterior. Two trusses 45' long constructed of light gauge steel are the structure that supports the cantilevers. The north face of the top module reveals the trusses through translucent, polycarbonate material allowing ambient natural light in during the day, and then at night, it becomes a lantern that silhouettes the truss.